Valorado por los clientes después de alojarse en el OPEN TERRACE FREE BIKES by Living Las Canteras. Clean nice place, close to the beach.Juan is a very good host, responds fast. Buena ubicación, piso bien equipado, anfitriones muy amables e informativos! Canteras is a good place to be. You stay near the playa and you have an urban flair. The apartment has everything you need. You can wash your clothes and you have a good kitchen. Juan gives you special insider tips. This is especially useful. Consigue un precio espectacular para el OPEN TERRACE FREE BIKES by Living Las Canteras. Las personas que se alojaron hace poco le han dado una puntuación de 9,3. Se encuentra a 200 metros de la playa de Las Canteras. El Luxury Suite Home & Terrace Living Las Canteras ofrece alojamiento en Las Palmas de Gran Canaria. 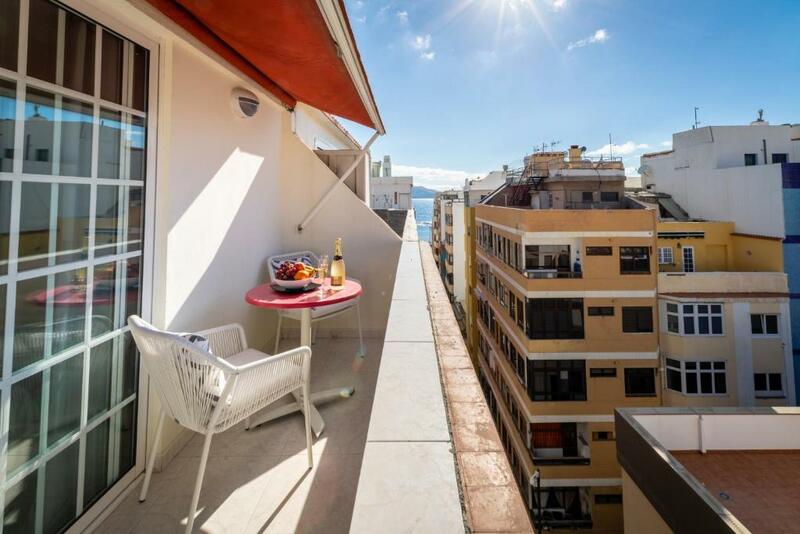 El Luxury Suite Home & Terrace.Living Las Canteras ofrece vistas al mar y WiFi gratuita. Este apartamento cuenta con terraza, 1 dormitorio doble, zona de estar con sofá cama y TV de pantalla plana y cocina equipada con horno, nevera, microondas y cafetera. El baño incluye ducha. La zona es ideal para practicar snorkel. Las Palmas de Gran Canaria está a 2,2 km. El Luxury Suite Home & Terrace. El Living Las Canteras. El establecimiento cuenta con instalaciones para deportes acuáticos y servicio de alquiler de coches. El aeropuerto de Gran Canaria está situado a 23 km. OPEN TERRACE FREE BIKES by Living Las Canteras recibe clientes de Booking.com desde el 2 de dic de 2016. ¿Cuándo quieres alojarte en el OPEN TERRACE FREE BIKES by Living Las Canteras? Este apartamento cuenta con dormitorio doble, baño con ducha, zona de estar con sofá cama y TV de pantalla plana, terraza, cocina con horno, nevera, microondas y cafetera y baño con ducha. The apartment is located just 100 metres from the city beach of Las Canteras, and only 10 min from the city center of Las Palmas (plaza España), and 30 min drive from the airport. Is a Rooftop (6th floor) with lift. The apartment has been renovated on September 2016 and offers peace and comfort. In the open terrace you can eat, read or just chilling out and enjoy the sun. The apartment is ideal for both traveling families with one kid and/or a baby and honeymooners. Moreover the distance between the main door of the building and the sand of Las Canteras beach is only 120metres exactly! Equipment: - Free Wifi 300mbps high-speed -Two urban bikes. -Bedlines, bath and beach towels. - One 1,5l bottle of water, oil, vinager, salt, sugar, infusions, fairy, shampoo, gel, hand soap and liquid detergent for the washing machine. - Beach toys for kids. Two masks for snorkle. -Crib and babyseat available for free on request. I will be happy to receive and manage any need you may have. The apartment is very well located. just 10 min from "intercambiador de Santa Catalina" where all buses departs to airport and south of Gran Canaria. The beach is only 15mtrs walking distance, and all commercial and city center are walking distance too. Also, the big mall "el muelle" is about 10 min walking from the apartment. Another shopping mall is about 5 min walking "El corte Ingles". About 10 min from the apartment you can find "Talasoterapia Las Canteras" one of my favorites places to relax, with salt water jets, sauna, turkish bath and warm/cold jacuzzis, everything for about 14 euros. Near the apartment you can find all services you need as: pharmacy, gym, restaurants, cafes, night club, pubs, cinemas, museums, and the best beach in the world ;) The Las Canteras beach is considered one of the best city beaches in the world. Facing north, it regularly spoil sun bathers with beautiful sunsets. It is over 3km long. Half of the beach offers surfing and the other is perfect for swimming since it is protected by a reef quarter of a mile from shore. I enjoy the food. Its fresh, high quality and cheap (compared to central Europe). The VAT is only 4% which helps. Léeme OPEN TERRACE FREE BIKES by Living Las Canteras acepta peticiones especiales. ¡Añádelas en el siguiente paso! Informa a OPEN TERRACE FREE BIKES by Living Las Canteras con antelación de tu hora prevista de llegada. Para ello, puedes utilizar el apartado de peticiones especiales al hacer la reserva o ponerte en contacto directamente con el alojamiento. Los datos de contacto aparecen en la confirmación de la reserva.